Join Margalit Cutler for a creative arts class. In this class, we will create tissue paper collages that resemble stained glass windows and depict Winter memories. These collages brighten up the room as light shines through them. The project is flexible to suite different skill levels and creative interests. 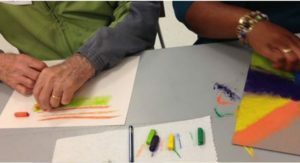 Workshop goals include creative growth, development of nonverbal communication skills, instilled confidence through creation and sharing, sense of community and fun!